Background Intravenous medication administrations have a high incidence of error but there is limited evidence of associated factors or error severity. Objective To measure the frequency, type and severity of intravenous administration errors in hospitals and the associations between errors, procedural failures and nurse experience. Methods Prospective observational study of 107 nurses preparing and administering 568 intravenous medications on six wards across two teaching hospitals. Procedural failures (eg, checking patient identification) and clinical intravenous errors (eg, wrong intravenous administration rate) were identified and categorised by severity. Results Of 568 intravenous administrations, 69.7% (n=396; 95% CI 65.9 to 73.5) had at least one clinical error and 25.5% (95% CI 21.2 to 29.8) of these were serious. Four error types (wrong intravenous rate, mixture, volume, and drug incompatibility) accounted for 91.7% of errors. Wrong rate was the most frequent and accounted for 95 of 101 serious errors. Error rates and severity decreased with clinical experience. Each year of experience, up to 6 years, reduced the risk of error by 10.9% and serious error by 18.5%. Administration by bolus was associated with a 312% increased risk of error. Patient identification was only checked in 47.9% of administrations but was associated with a 56% reduction in intravenous error risk. Conclusions Intravenous administrations have a higher risk and severity of error than other medication administrations. A significant proportion of errors suggest skill and knowledge deficiencies, with errors and severity reducing as clinical experience increases. A proportion of errors are also associated with routine violations which are likely to be learnt workplace behaviours. Both areas suggest specific targets for intervention. Limited detailed analysis of the specific types of errors which occur in intravenous medication administrations, or those associated with the most severe outcomes, has occurred. Further, investigations of specific nurse characteristics or the relationship between compliance with recognised administration practices and intravenous error rates are rare, and reduce the potential to develop effective interventions. This aim of this study was to measure the frequency, type and severity of intravenous medication administration errors in hospital and assess the associations between errors, procedural failures and nurse experience. The study was undertaken at two major teaching hospitals in Sydney, Australia, located 40 miles apart. The authors undertook direct observation of 107 nurses, 53 across four wards in Hospital A (400 beds) and 54 nurses across two wards at Hospital B (326 beds) as they prepared and administered medications. The study wards had an average of 28 beds and included geriatrics, respiratory, renal/vascular, orthopaedics and neurology, and had both surgical and medical patients. Data were collected at Hospital A between September 2006 and February 2007 (340 h of direct observation) and at Hospital B between November 2007 and March 2008 (164.75 h). This paper reports analysis of 568 intravenous medication administrations which were a subset of data from a larger study of all types of medication administrations.3 Human research ethics approval was received from both hospitals and the University of Sydney. Nurses were invited to participate and were informed that the aim of the study was to identify errors in the preparation and administration of medications. Eight-four per cent (107/126) of nurses participated. Researchers arrived on the wards at the peak medication administration times (07:00–21:30) and shadowed individual nurses who had provided consent. Observers were instructed in a ‘serious error’ protocol which allowed them to intervene if they witnessed an administration which was potentially dangerous. This occurred 10 times. 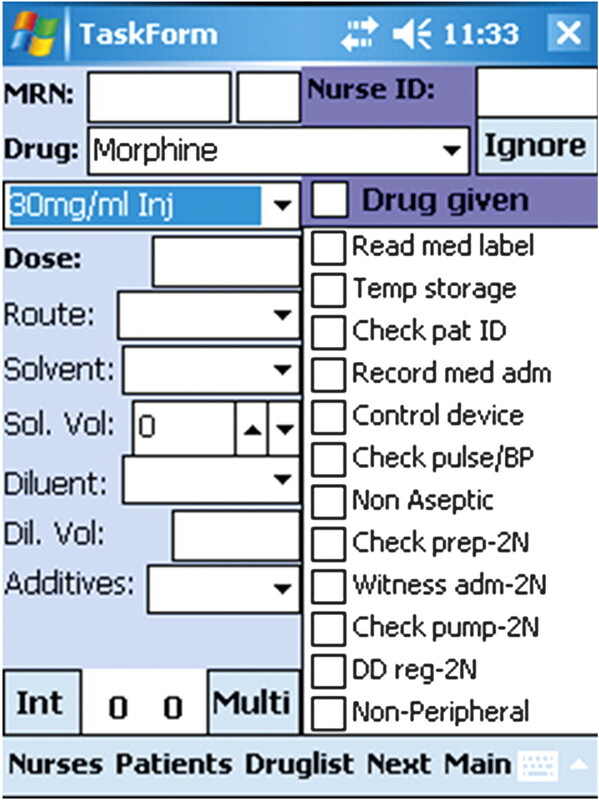 A structured observational tool14 was developed and incorporated into software on a handheld computer (personal digital assistant—PDA) Further details of this method have been reported elsewhere.14 Figure 1 shows the data collection software with the list of the procedures (see also box 1 for definitions) which are checked during the observation and the details recorded for each drug administered. During observations researchers recorded medication administration procedures and details of the medications administered, such as drug, dose and route (researchers did not view patients' medication charts during observations). Years of nursing experience for each participant were also recorded. Personal digital assistant data collection tool. Wrong intravenous rate: administration of intravenous drug at a faster rate than recommended in the Australian Injectable Drugs Handbook (AIDH).15 Administration of intravenous bolus or intravenous infusion ≥15% faster than recommended. Drug incompatibility: one drug given with another drug or solution via the same intravenous infusion, or same bag, which is NOT documented to be compatible. For example: frusemide and cefotaxime administered in combination. *Some medications such as ‘drugs of addiction’ for example, opioids, are listed as ‘controlled’ substances (also known as ‘dangerous drugs’) according to legislation and regulations. Box 1 lists and defines the procedures that were observed. Compliance with all procedures included in the study is required practice by nurses working in public hospitals in the state of New South Wales. To determine the rate of bolus injections we used an inbuilt timer in the PDA. The observer viewing a bolus injection would press ‘start’ when the nurse begins injecting the drug (disregarding any line flushing), and press ‘stop’ when the nurse stopped the administration. For assessing the rate of intravenous infusions the observer would record the infusion pump rate or count the number of drops per minute delivered by the administration set along with noting the type of administration set used, that is, standard macro set 20 drops/min or paediatric set 60 drops/min. All observers (n=3) were registered nurses or doctors and trained in the use of the tool and data definitions. Inter-rater reliability was calculated by two researchers independently observing the same nurse and then comparing agreement between data elements. Inter-rater reliability tests for 16 observation sessions produced Kappa scores16 of 0.94–0.96 showing high levels of agreement. Observers were trained to be physically close to study participants (approximately within 1 m) to allow them to determine, for example, whether the nurse checked the medication label prior to administration. Thus establishing good rapport and trust was essential. This was achieved by observers undertaking many practice sessions involving over 30 h over several weeks with nurses prior to formal data collection so that they became comfortable with the observers' presence and accustomed to being studied. Procedural failures (box 1) were identified at the time of observation. Identification of clinical errors required a review to assess if preparation was in accordance with the Australian Injectable Drugs Handbook15 and observational data to be compared with each patient's medication chart to determine whether the medication administered differed from the order. This process involved a clinical pharmacist and an experienced nurse, both independent of the study hospitals. Box 1 provides the definitions of the four intravenous-specific error types which were the focus of analysis. The severity of clinical errors was classified by two researchers using a five-point scale17 (table 1). Disagreement was settled by consensus and a clinical pharmacologist consulted when required. A panel was established to review the most serious errors and a random selection of other errors. We calculated rates of procedural failures, clinical errors and serious errors using total number of drug administrations (ie, total doses administered) as the denominator. Each drug administration could be associated with none or multiple procedural failures and/or clinical errors. We conducted univariate analyses to identify factors associated with error rates. To assess the association between nurse experience and error we used multivariable logistic regression. We created two continuous variables from years of experience with estimated trend change at 6 years in the following way: inexperienced (<6 years)=min(experience, 6), experienced (≥6 years)=max(0, experience-6). Various trend change points were tested; however, 6 years produced the best model fit. In these models the outcomes of interest were, respectively, risk of at least one clinical error and risk of serious error. The explanatory factors included nurse experience, intravenous administration type (infusion or bolus), patient identification procedure and hospital. We removed hospital from the models as the hospitals differed with respect to the variable of interest, experience. We included interaction terms but removed them when they failed to reach significance, which was set at p=0.05. At least one procedural failure was recorded for 73.9% of 568 intravenous medication administrations (table 2). Most procedures had a high compliance rate, but compliance with all relevant procedures was low at 26.1%. Patient identification was checked in less than 50% of all intravenous administrations. One or more clinical errors occurred in 396 (69.7%; 95% CI 65.9 to 73.5) intravenous administrations. Of these, 25.5% (95% CI 21.2 to 29.8) were rated as serious (≥3). No errors were rated ‘5’ as contributing to the death of a patient. In total, 511 clinical errors were identified—297 administrations had one error, 85 had two, 12 had three, and two administrations had four clinical errors. Four error types (wrong mixture, wrong volume, wrong rate or drug incompatibility) accounted for 91.7% (n=363) of all clinical errors, 99 of which were rated as serious. The remaining errors were: wrong timing (n=31); wrong route (n=1) and wrong drug (n=1). Hence 63.9% (363/568; 95% CI 60.0 to 67.9) of intravenous administrations had at least one of four intravenous-related error types, which were the focus of the following analyses. Wrong intravenous rate was the most frequent error and most likely to be rated as serious (table 3). Intravenous error rates and serious error rates varied by type of drug as shown in table 4. In the most frequent type of drug administered, anti-infectives, two-thirds of administrations had at least one error. Although used infrequently, antiulcerants and antiemetics had very high error rates (respectively 93% and 75%) and for antiemetics 44% were rated as serious. Type of drug was also associated with different types of error (table 5). Intravenous administrations performed via bolus (n=312) had higher error rates than infusions (n=256) (77.2% vs 47.7%; χ2=53.37, df=1, p<0.0001) and also higher serious error rates (23.4% vs 10.6%; χ2=15.34, df=1, p<0.0001). For bolus intravenous infusions, all 72 serious errors involved incorrect rate, with nine also involving wrong volume, wrong mixture or incompatible drug. For intravenous infusions, wrong rate was involved in 23 and wrong volume in 15 of 28 serious errors. Inexperienced nurses incurred more errors in bolus intravenous infusions (83.0% for nurses with <6 years experience vs 71.2% for nurses ≥6 years (χ2=6.15, df=1, p=0.02)). Infusion pumps were rarely used (17.6% of 256 infusions). Use of a pump was not associated with a significant decrease in error rate (pump: 13.3% (6/45 infusions) vs no pump: 18.5% (39/211); χ2=0.6790, df=1, p=0.4099), nor serious error rate (pump: 83.3% serious errors vs no pump: 46.2%; χ2=2.8766, df=1, p=0.0899). Nurses with <6 years experience were less likely than experienced nurses to use an infusion pump (9.3% vs 23.6%; χ2=8.92, df=1, p=0.0028). The median nursing experience of the 107 nurses was 6 years (range <1–43 years). Logistic regression showed that during the first 6 years of nursing experience the risk of error declined by 10.9% with each successive year of experience (table 6). After this point, further experience provided no additional benefit. Checking patient identification reduced error risk by 56%, while administration via intravenous bolus increased it by over 300%. The risk of serious error declined by 18.5% per annum during the first 6 years of experience, with no additional benefit thereafter. Checking patient identification reduced risk of serious error, and administration via intravenous bolus greatly increased the risk of serious error (table 7). Nearly 70% of all intravenous medications administered had at least one clinical error, and a quarter of these were serious errors likely to result in permanent harm to patients. Few comparative studies are available. Direct observational studies in the UK9 and Germany10 revealed overall error rates of 49% (212/430 intravenous administrations) and 48% (58/122). A more recent study of vancomycin intravenous administrations reported a high rate of 81% (116/143 intravenous administrations) in four wards in a hospital in Brazil.11 An Australian study12 of continuous infusions among surgical patients reported an 18% error rate but excluded infusions such as antibiotics. This drug group was the most frequent in our study and may be one reason for our rate differences. Only two studies9 10 assessed error severity and used a 10-point scale anchored at 0 no harm to 10 death. Severity categories were collapsed into <3 (minor), 3–7 (moderate) and >7 severe. In the UK study9 1% of intravenous errors were rated as severe and 29% moderate; in the German study 3% were severe and 31% moderate. Given the differences in severity scales, our result of 25.5% serious errors appears reasonably consistent with these findings. A systematic review and Bayesian analysis of nine studies of intravenous administration errors reported an overall probability of at least one error in 73% of intravenous administrations.18 This is similar to our finding of at least one clinical error in 70% of administrations observed. The analysis by McDowell et al18 relied on data from studies published between 1990 and 2006 (more than half reflected data collected over 10 years ago). When no data were available estimates were used. Few of these previous studies collected detailed information about procedural failures. For example, only two studies in McDowell's review collected information about checking patient identification and both reported no errors. McDowell et al18 reported that the reconstitution step was the most error prone and that the checking of patient identification was the least. We found the opposite. Factors such as the increased use of pre-prepared injections, which is recommended practice in New South Wales public hospitals, as part of contemporary medication administration practice may be one reason for our lower error rate in this category. While infusion pumps have the potential to reduce errors, their effectiveness in everyday practice is often seriously compromised by a failure to use devices as intended, for example by-passing safety features and ignoring alerts.23 24 We found a low utilisation of pumps especially among less experienced nurses, the group with the highest error rate. However, use of pumps was not associated with reduced errors. The extent to which this was due to incorrect use is unknown. Few studies have examined the association between nurse experience and intravenous medication errors. We found that as nurses gained experience up to 6 years, their rates and severity of errors declined significantly. This is an important finding and clearly suggests that inexperienced nurses should be a target for training and supervision with a focus on correct intravenous rates. Han et al12 found no relationship between experience and intravenous administration errors, but their sample was vastly more experienced (median 18 years) compared with our study (median 6 years). We found a significant relationship between failing to check a patient's identification and making an intravenous administration error. While failing this check does not cause a clinical error, we hypothesise that it is an indicator of a general failure to follow correct administration protocols, whether this is because the nurse is under stress, time pressures, or selects to not comply. This finding suggests that this variable could be used as a proxy measure for increased risk of clinical error, and interventions which reinforce compliance with administration protocols may be effective in reducing clinical errors. The poor compliance found with checking patients' identification (47.9%) suggests that this is a routine violation25 performed by a large proportion of nurses. We used an undisguised observational technique and nurses were aware that our study was investigating problems in medication administration procedures and errors. It is possible that nurses changed their behaviours when observed. The outcomes of this possible bias would be to lead to an underestimation of the ‘true’ error and procedural failure rates. The length of the study, which involved researchers being on the wards for many months, reduces the likelihood of sustained behaviour change by nurses on busy hospital wards. Further, observational studies of clinicians in situ have suggested that the extent of behaviour change is minimal.26 27 For example, Dean Franklin and Barber28 found no difference in the rate of omitted medication doses when nurses in a UK hospital were observed versus those times when they were not. Our sample also only relates to Australian nurses and thus may not be generalisable to countries with very different nursing practice. Our findings suggest that a significant proportion of IV administration errors reflect knowledge and/or skill deficiencies, with errors reducing in the first few years of clinical experience. A proportion of errors are also associated with routine violations25 which are likely to be learnt workplace behaviours which persist regardless of increased clinical experience. Both areas suggest specific targets for intervention. Such interventions could include more training and supervision of new nurse graduates and consideration of a reduced use of bolus intravenous infusions. Raising nurses' awareness of the high intravenous administration error rate is also likely to be helpful in reinforcing compliance with correct procedures. Nurses receive very limited feedback of outcome data about performance and the nearly total absence of studies on this topic in the last 5 years is likely to have contributed to its low profile as an important safety issue. We thank the nurses at the study sites for their participation, without which this study would not have been possible. National Patient Safety Agency. Safety in doses: improving the use of medicine in the NHS. London: National Patient Safety Agency, 2009.
. Retrospective analysis of mortalities associated with medication errors. Am J Health Syst Pharm 2001;58:1835–41.
. Association of interruptions with increased risk and severity of medication administration errors. Arch Intern Med 2010;170:683–90.
. Medication errors observed in 36 healthcare facilities. Arch Intern Med 2002;162:1897–903.
. Identification and verification of critical performance dimensions: phase I of the systematic process redesign of drug distribution. Pharm World Sci 2003;25:118–25.
. The incidence and nature of prescribing and medication adminsitration errors in paediatric inpatients. Arch Dis Child 2010;95:113–18.
. When the 5 rights go wrong: medication errors from the nursing perspective. J Nurs Care Qual 2010;25:240–7.
. Drug administration errors: a study into the factors underlying the occurrence and reporting of drug errors in a district general hospital. J Adv Nurs 1995;22:628–37.
. Ethnographic study of incidence and severity of intravenous drug errors. BMJ 2003;326:684.
. Incidence and severity of intravenous drug errors in a German hospital. Eur J Clin Pharmacol 2004;59:815–17.
. Vancomycin administration: mistakes made by nursing staff. Nurs Stand 2008;22:35–42.
. Factors predictive of intravenous fluid administration errors in Australian surgical care wards. Qual Saf Health Care 2005;14:179–84.
. Systems analysis of adverse drug events. ADE Prevention Study Group. JAMA 1995;274:35–43.
. Development and testing of an observational method for detecting medication administration errors using information technology. In: Saranto K, Brennan PF, Park H, Tallberg M, Ensio A, eds. Studies in health technology and informatics. Amsterdam: IOS Press, 2009:429–33. Society of Hospital Pharmacists of Australia. Australian injectable drugs handbook. 4th edn. Melbourne: Society of Hospital Pharmacists of Australia, 2008.
. Tips for learners of evidence-based medicine: measures of observer variability (kappa statistic). CMAJ 2004;171:1369–73. New South Wales Health Department. Severity Assessment Code (SAC) Matrix. Sydney: NSW Health, 2005. http://www.health.nsw.gov.au/pubs/2005/sac_matrix.html.
. Where errors occur in the preparation and administration of intravenous medicines: a systematic review and Bayesian analysis. Qual Saf Health Care 2010;19:341–5.
. An observational study of intravenous medication errors in the United Kingdom and in Germany. Pharm World Sci 2003;25:104–11.
. Medication errors in intravenous drug preparation and administration: a multicentre audit in the UK, Germany and France. Qual Saf Health Care 2005;14:190–5.
. Causes of intravenous medication errors: an ethnographic study. Qual Saf Health Care 2003;12:343–7.
. Do calculation errors by nurses cause medication errors in clinical practice? A literature review. Nurse Educ Today 2010;30:85–97.
. Medication administration safety. In: Hughes R, ed. Patient safety and quality: an evidence-based handbook for nurses. USA: Agency for Healthcare Research and Quality, 2008.
. The use of smart pumps for preventing medication errors. J Infus Nurs 2009;32:257–67.
. Human error. Cambridge: Cambridge University Press, 1990.
. Direct observations of nursing home care quality: does care change when observed? J Am Med Dir Assoc 2006;7:541–4.
. Comparison of self-reported and observational work sampling techniques to measure nurses' work. J Health Serv Res Policy 2007;12:18–24.
. Validity and reliability of observational methods for studying medication administration errors. Am J Health Syst Pharm 2001;58:54–9. Funding This research was funded by National Health and Medical Research Grants 455270 and 568612. Ethics approval Study hospital and the University of Sydney.